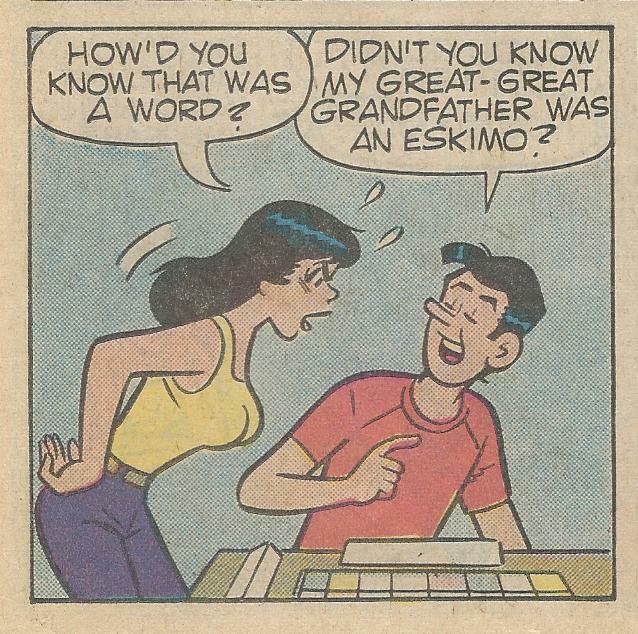 Now, first, Jughead and his writers need a to be educated in the proper language to use when discussing Native Canadian status, but second, what this panel also asserts is that the amazing Jughead Jones has a Native Canadian ancestry. So the questions arise: is this something that has a history? This is from Archie Giant Series Magazine #529, August 1983, which gives Jug's ancestry a scant 33 years. Is it something taken up later on, or in the Jughead reboot from this year? If you're paying attention, you know that the abuses of Native Canadian and American peoples, and of Indigenous peoples more broadly, has been, and continues to be, one of the most egregious abuses of human rights ever. Positive portrayals of Native peoples in popular culture, though only a small contributor to what needs to be fixed, are vital. Jughead made some waves earlier this year with the acknowledgment of his Asexual status in a recent comic. I wonder if this aspect of the character is something the current writers might take up? Now, for the sake of context, the story ("A Word to the Wise") continues with Jug joking about this ancestor being "the only cop north of Nome...'Ol' Bluenose Jones' they called him!" prompting from Veronica a command to "Cut the jokes!" They move on, and it's never mentioned again. The prompt for Jug's declaration is his knowledge, during a game of Scrabble, of the word "umiak" - "a large open skin boat once widely used throughout the Arctic for whale hunting, or moving materials and groups of people." I'll admit, there's an ambiguity to the sequence, but that ambiguity opens us to a very cool reading - Jug's deploying knowledge learned from his great, great Grandfather for a wonderful purpose: to frustrate Veronica Lodge. And really, in Archie comics, what greater purpose is there? So I'm curious. Anyone out there ever see anything like this in Archie comics, or was this a one-off? Funny that you equate "Eskimo" with "Native Canadian". It could just as well mean "Native (US) American", "Native Russian", or "Native Greenlander". AFAIK, Nome is in the United States.